They say the kitchen is the heart of the home. So, during the summer the same could be said for an outdoor kitchen. Working in an outdoor kitchen gives you the chance to be a part of the fun while grilling dinner and whipping up a refreshing salad for your guests. There’s a lot more to an outdoor kitchen than a fancy gas grill. The most elaborate examples replicate an entire 5-star chef’s kitchen outside—complete with a massive grill, gas burners, a sink, refrigerator, beverage cooler, ice maker and warming drawers. 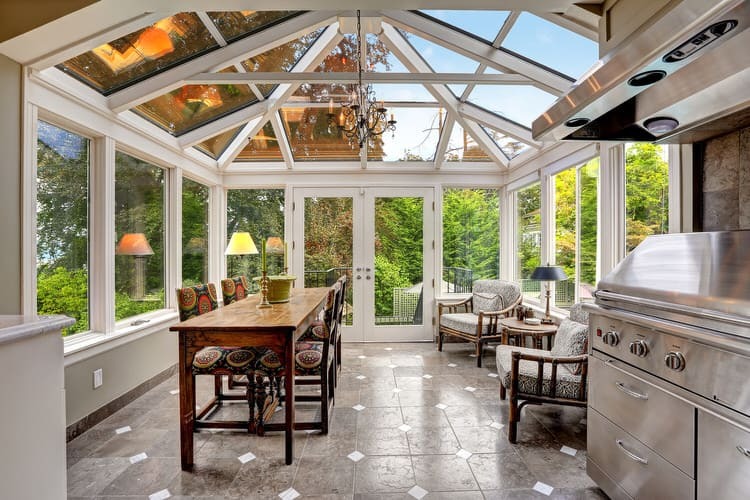 If you live in a temperate climate, you’ll never have to cook indoors again! 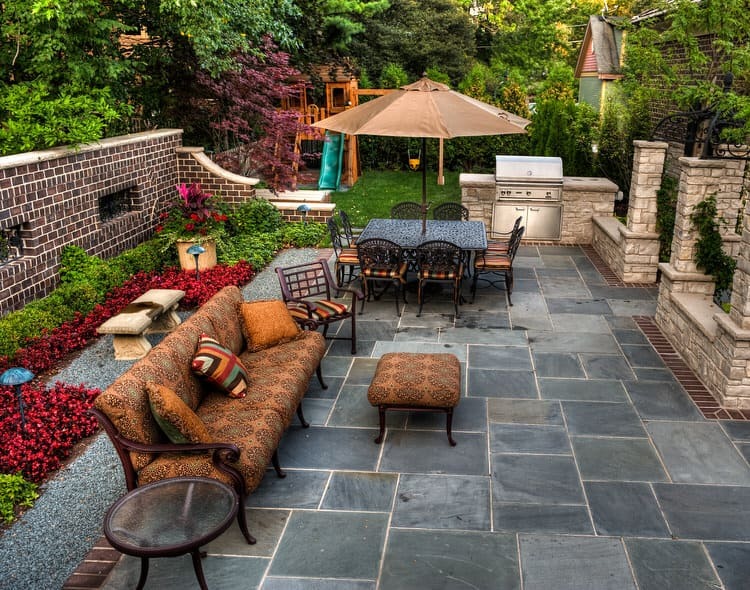 Before you start the planning process, consider the size of your existing patio area. 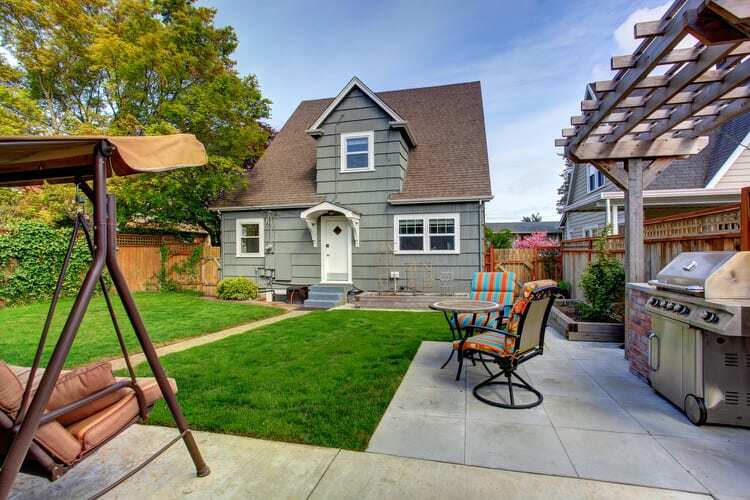 Determine what you’d like to keep or expand on and what will fit the space and your budget. And don’t overlook key elements like lighting. You’ll need plenty of targeted illumination for cooking after sunset. A clip-on grill light just won’t cut it! 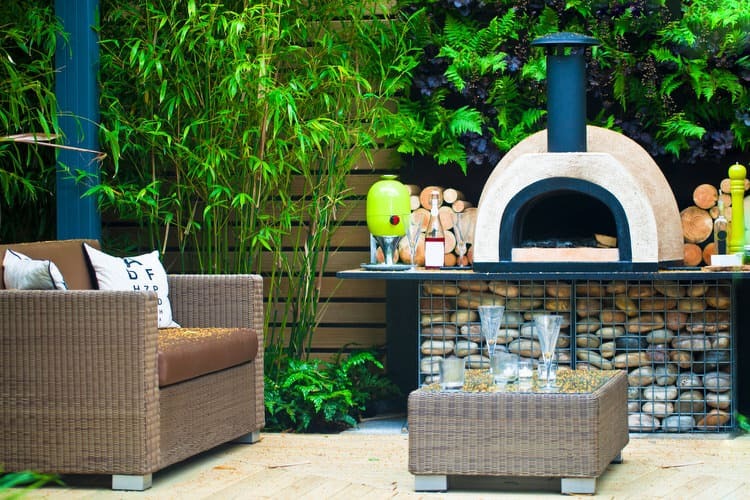 If you are still struggling with ideas for your outdoor kitchen, we are here to help with the best designs, appliances and accessories. 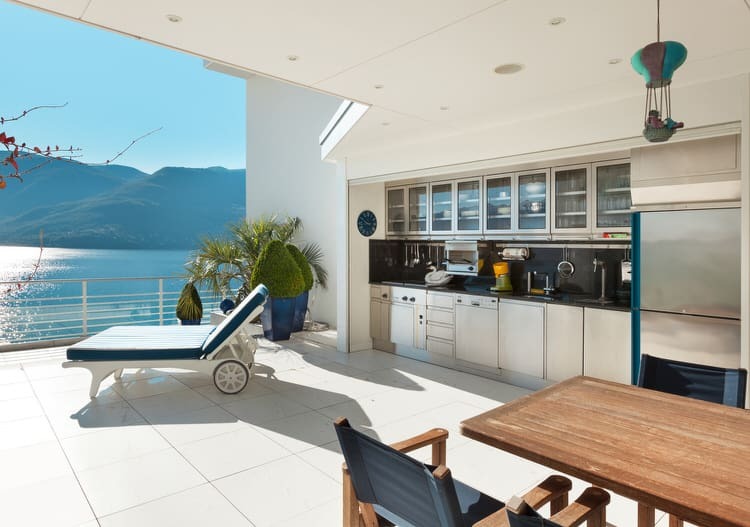 Let this gallery of fantastic outdoor kitchens be your guide to the world of gourmet cooking and entertaining al fresco! This lovely L-shaped kitchen has a concrete countertop, a grill, sink, refrigerator, ice maker and a fireplace. The homeowner included upper cabinets for added function and storage in this sheltered cooking and dining space. 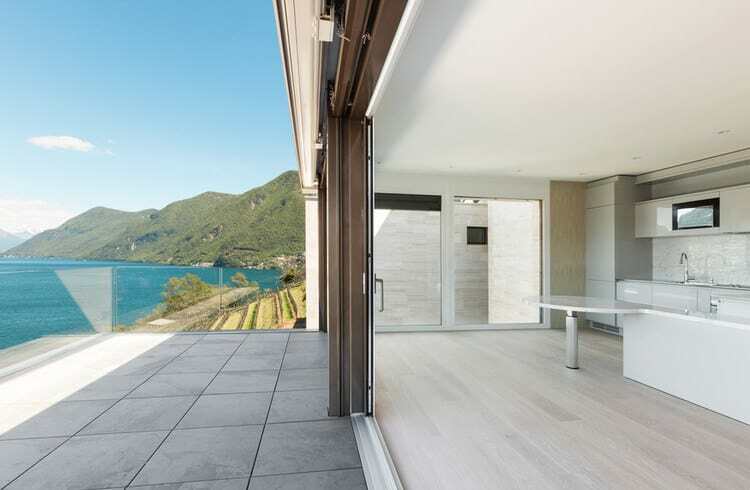 There’s no need for a separate outdoor cooking area for this sea view residence. This indoor kitchen becomes an outdoor kitchen in an instant with the opening of wall-to-wall windows. When the furniture gets delivered it will definitely be party time at this vacation home! This super long outdoor kitchen unit will be around for a long time. 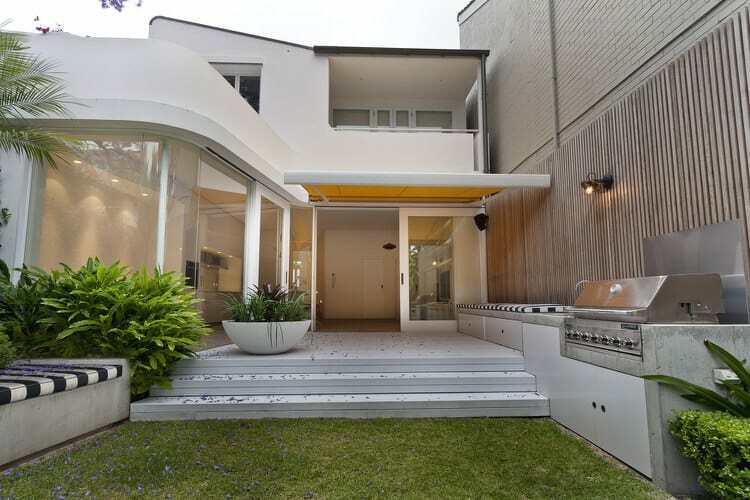 It was made to last with a steel reinforced frame covered in stucco and faced with gorgeous natural stone. The kitchen includes a 32-inch gas grill, dual burners, utensil drawers, a sink and ample counter seating for guests. 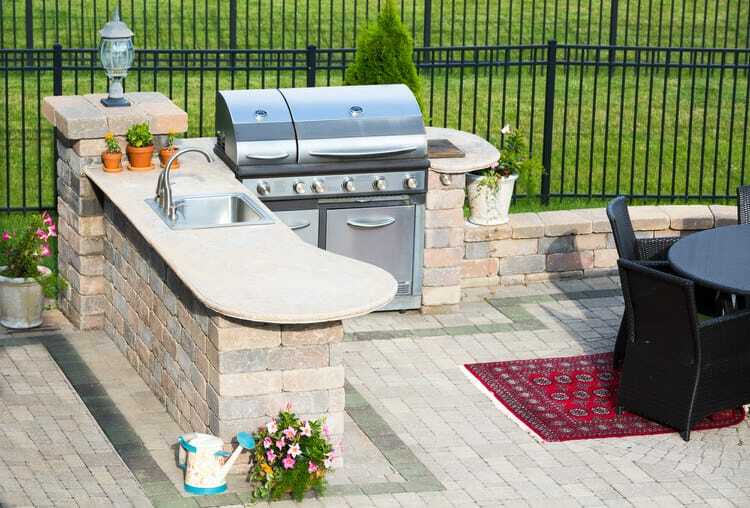 Adding an island to your outdoor kitchen makes the space more efficient and gives you more room for storage. Outdoor islands are available in many prefab, modular options to fit different configurations and budgets. Or, if you like, you can spring for a custom build. Selecting a prefabricated outdoor kitchen unit takes the guesswork out of the design because it’s already been done. They’re also much less expensive than a custom kitchen and can be installed in as little as a few hours. Stacked stone, stucco and granite are just a few of the options from which to choose. An outdoor kitchen with a plumbed sink is a huge convenience, especially if it located a distance away from your house. A bar, prep or full sink will allow you to rinse dishes and clean your hands as you cook. If you have an outdoor spigot nearby, run the water line from that location to save money. 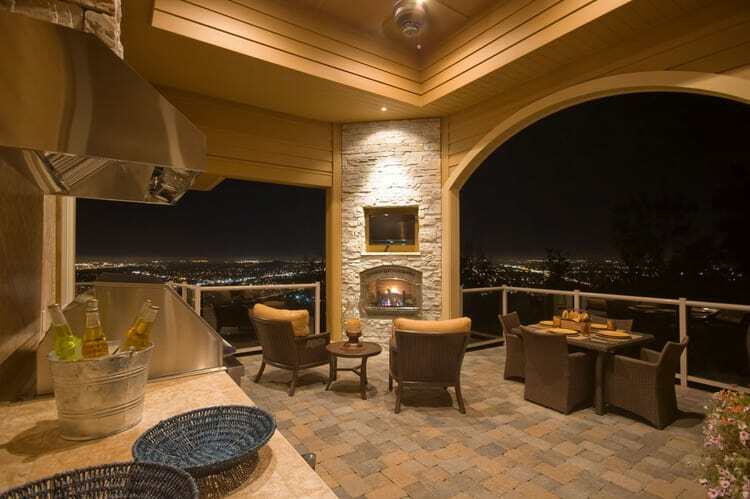 This outdoor kitchen design is perfect for entertaining while you cook. Your guests can perch at the bar sipping their drinks and enjoying conversation and appetizers while you prepare the next course. You’ll never feel left out of the festivities. Stainless steel is still the vanguard for outdoor grills. It is a low-maintenance, durable material. 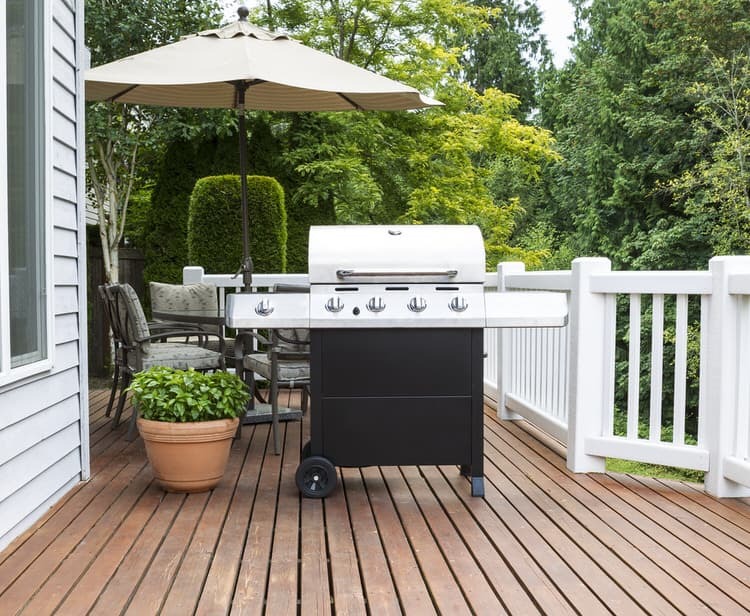 Although stainless stands up to most anything the weather can dish out, it is best to locate your grill under an overhang or protect it with a weather-resistant slipcover. 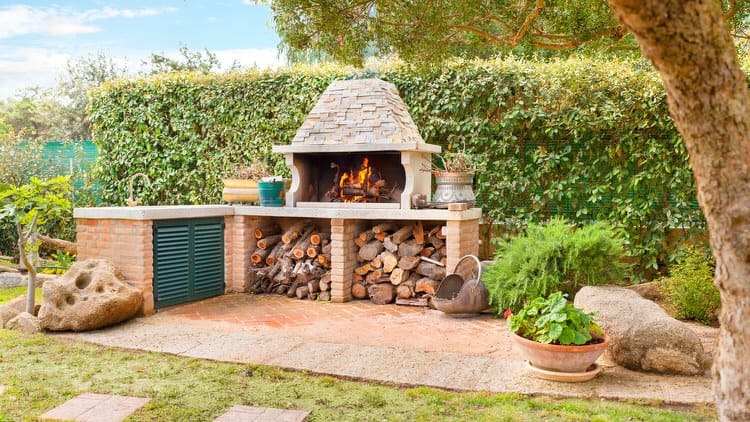 For these lucky homeowners, the built-in brick oven and grill was the main selling point of this Mediterranean-style home. The patio backs right up to the outdoor kitchen making it perfect for both lounging and entertaining friends and family. 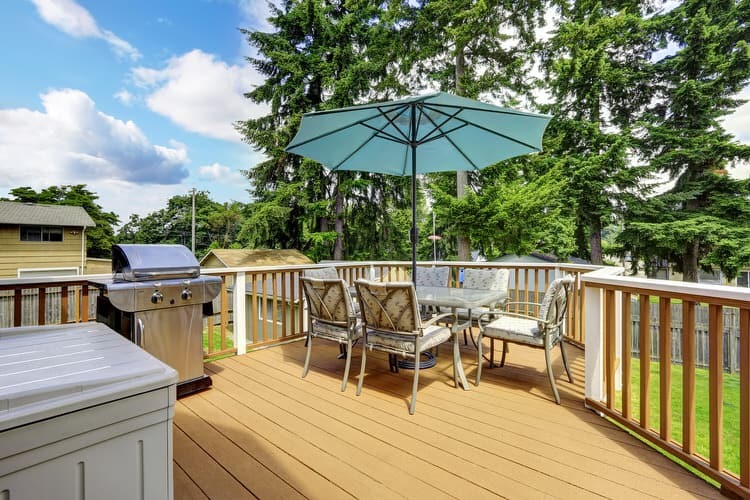 This fully-equipped, state-of-the-art outdoor kitchen is completely segregated from the rest of the outdoor living areas. The layout recreates functional spaces much like the interior of a house. Most landscape designers will tell you an outdoor kitchen/dining space is more efficient when separated from pool or lounge areas. 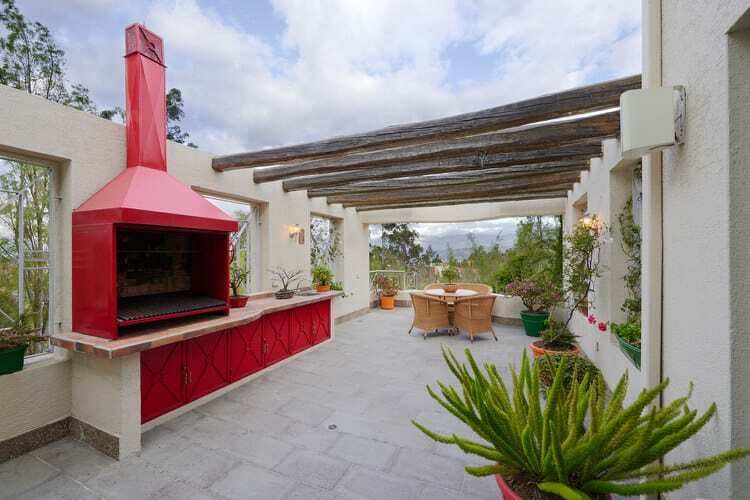 When planning your outdoor kitchen take advantage of the surroundings—especially if you have a view. From any location in this cooking and dining space, you will be able to take in the serene lake—and really, isn’t that what outdoor living is all about? This rustic brick kitchen is ready for cookouts and year-round entertaining. The homeowners use the table as a prep island and for serving buffet-style during the peak barbeque months. In the fall and winter, the table goes away and outdoor seating takes its place right in front of the fireplace. This high-tech chrome and stainless pizza oven turns out some of the best Italian pies this side of the Atlantic. Obviously, the homeowner is the hit of the neighborhood when pizza night rolls around. 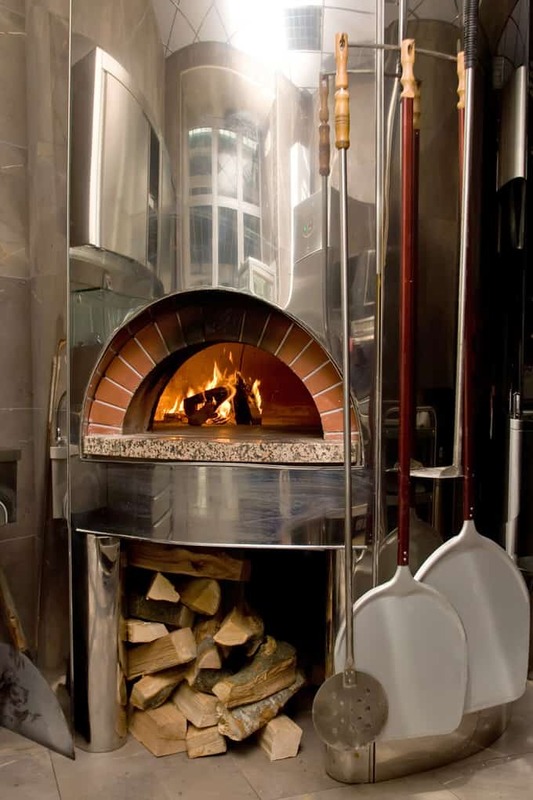 A state-of-the-art wood-fired oven like this one will cook your favorite thin and crispy pizza in less than two minutes! 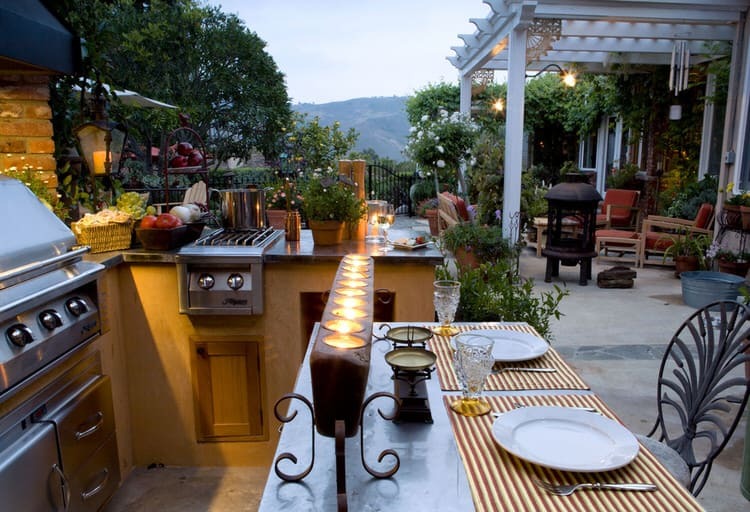 An outdoor kitchen doesn’t have to have all the bells and whistles to cook a delicious meal. This portable grill has side burners and an extra large cooking surface. It is easy to connect to your home’s gas line or to a propane bottle. Plus, it’s a breeze to clean and easy to transport. When you move, your mini outdoor kitchen moves right with you. If you’re ready to do some al fresco entertaining, a grill is a must-have. 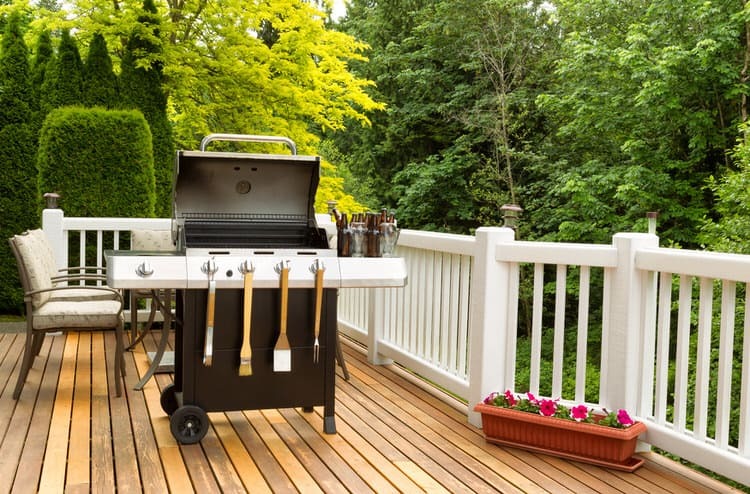 But don’t these forget other appliances to make outdoor food preparation a breeze. Refrigerators, dishwashers, beverage coolers, flat griddles and warming drawers are just some of the add-ons to consider. 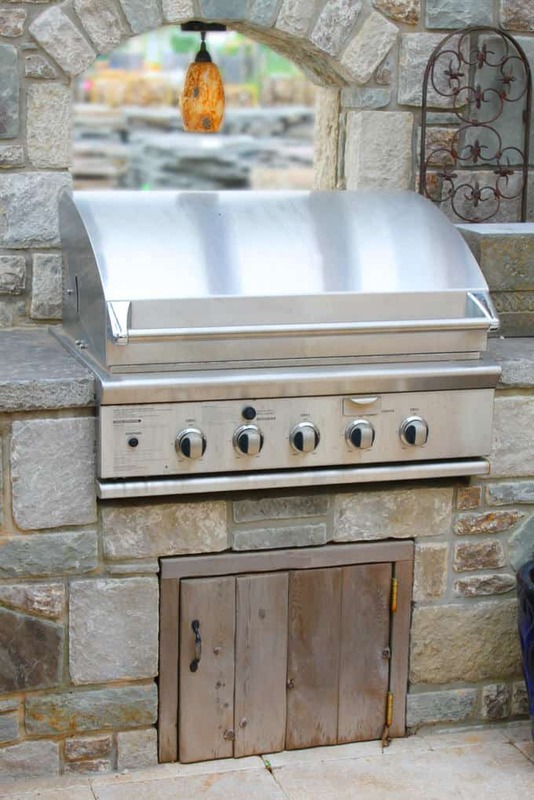 Consider installing a ventilation hood for your grill—especially if your outdoor kitchen is adjacent your house. Grill cooking creates a lot of smoke and odor that can easily creep into your house whether the windows are open or not. 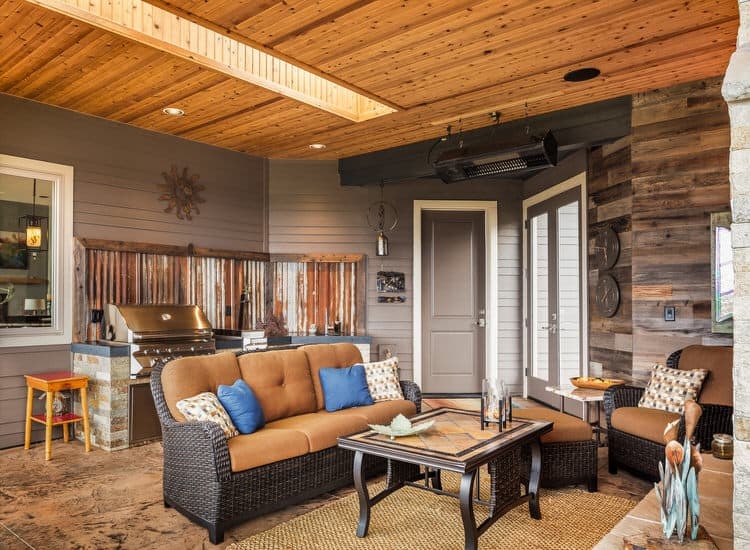 This outdoor living space and grilling station is the perfect setup for summer get-togethers. The modular grilling unit has a brick veneer façade that coordinates with the home’s siding and patio flooring. 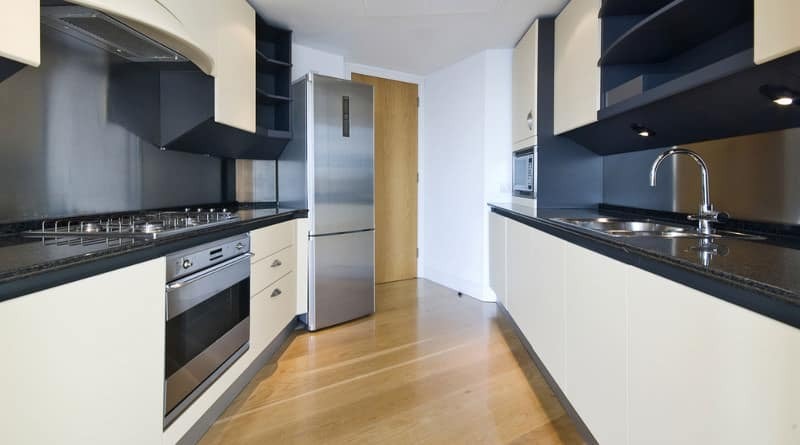 It features separate cooking zones, stainless grates and a rotisserie. This streamlined stainless kitchen is a custom creation designed exclusively for the homeowner. In addition to a variety of high-end features, this setup has utensil drawers and concealed trash bin plus plenty of extra storage for supplies so you can avoid repeated trips into the house. 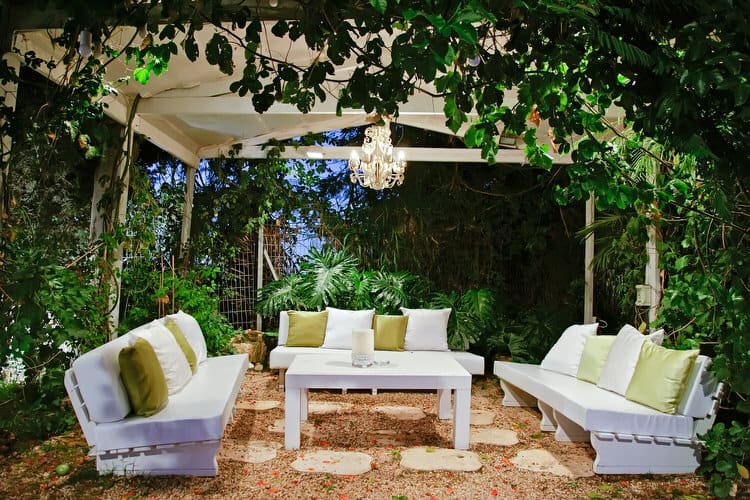 If you have a limited square footage, you can still create a resort-like space on a terrace. This entertaining area is complete with a fully-functioning outdoor kitchen adjacent to dining and the cocktail pool. The grilling station may not be huge, but it packs in big features like double side burners, a sink, small fridge and storage beneath. 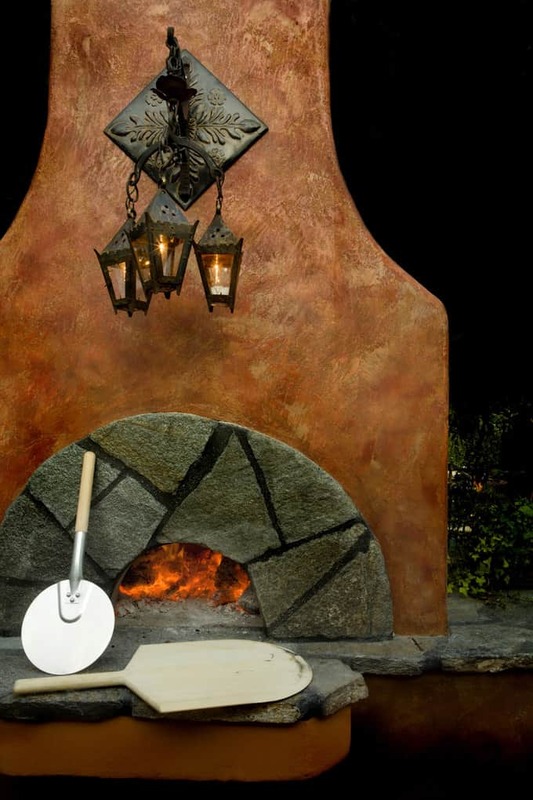 If you can’t resist the char and smoky flavor of a wood fired pizza, why not add a pizza oven to your outdoor kitchen. This example is a custom design, but you can find prefab kits and lots of help from DIY ideas and how-to guides online. 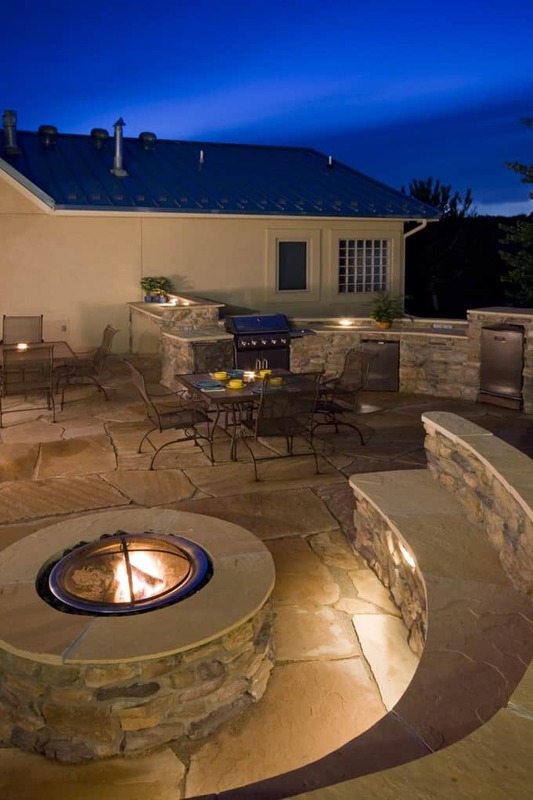 No matter the size of your outdoor kitchen, installing the right lighting will completely transform your cooking experience. You may have plenty of light for prep areas, but you’ll also need your cooking surfaces illuminated. How can you expect to tell if your guest’s steak is medium well if you can’t see it? 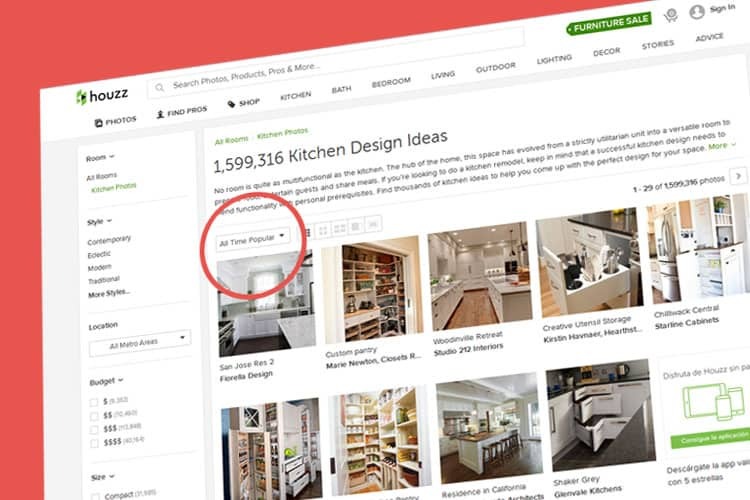 You’ve selected the perfect site and designed what you think is the best layout for your outdoor kitchen. Now you need to put those plans into action. First and foremost, address the utilities. Don’t try to do this job yourself—it is worth the extra money to hire the professionals to run lines for plumbing, electric and gas. If any building permits are required, securing a licensed contractor will ensure you don’t run into any unforeseen problems or delays. 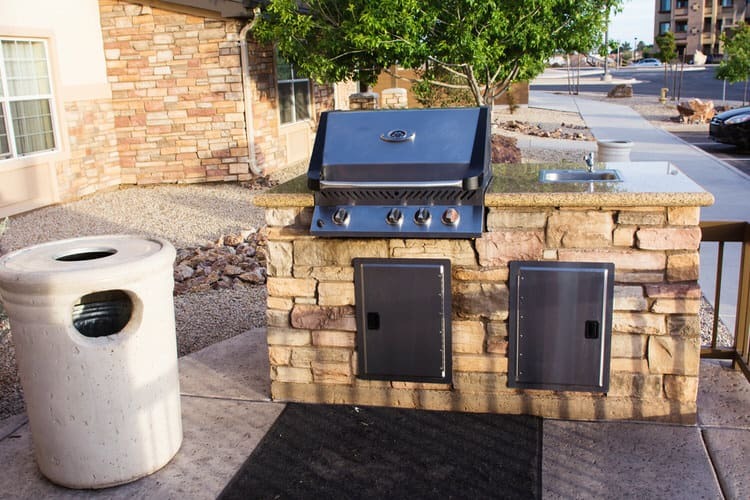 If you’re not into gleaming stainless gas grills, why not go a bit more primitive by adding a combination outdoor oven/parrilla to your kitchen. Spanish for grill, the parrilla is a partially enclosed cooking area that features an elevated steel grate and uses wood or charcoal for cooking. 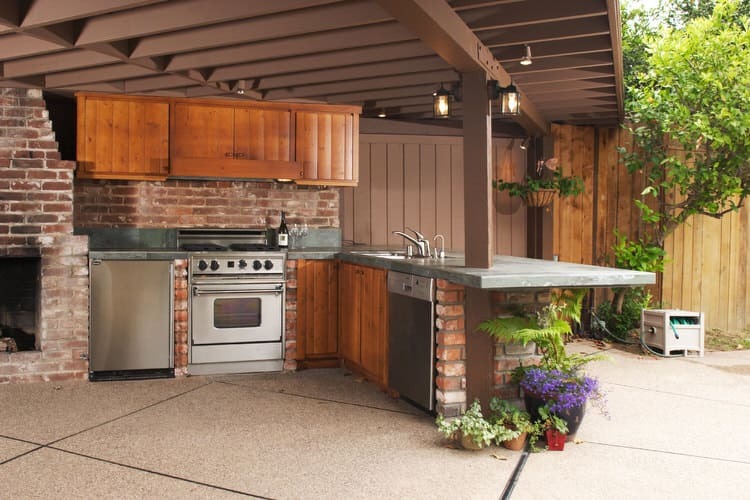 This outdoor kitchen takes up only a small fraction of the overall living space in this backyard. The built-in kitchen unit offers plenty of counter surface, storage and a 32-inch grill. That’s a lot of functionality in a compact space. Portable gas grills are so convenient. They require little assembly and virtually no setup, except for the gas bottle connection. They feature push-button ignition and allow you to control the heat in different cooking zones with a simple twist of a knob. 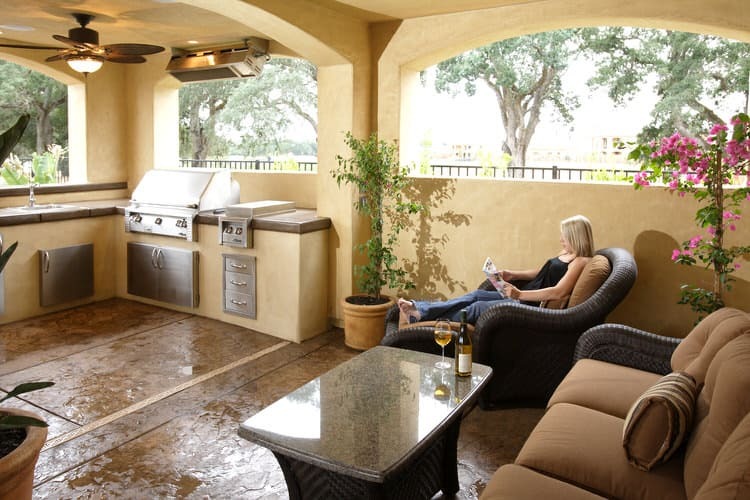 Placing an outdoor kitchen near your house makes sense for a number of reasons. You’ll find it more convenient to be close by if you need to make a run for extra supplies. 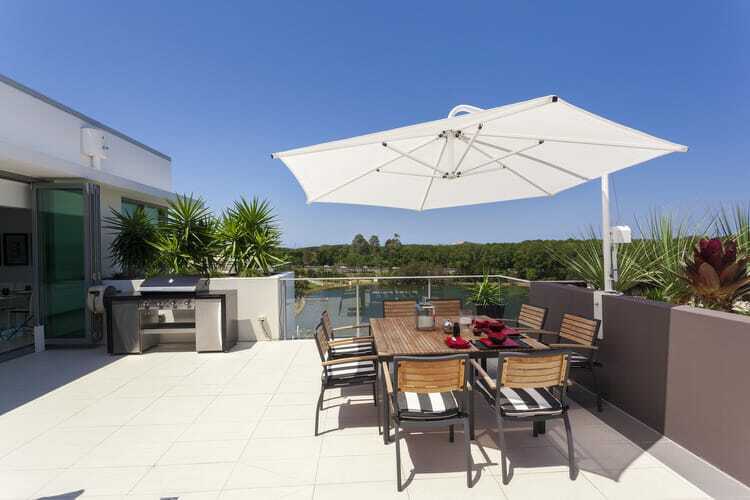 It’s easy to attach a pergola or overhead structure from the house to provide shade and protection from the elements. 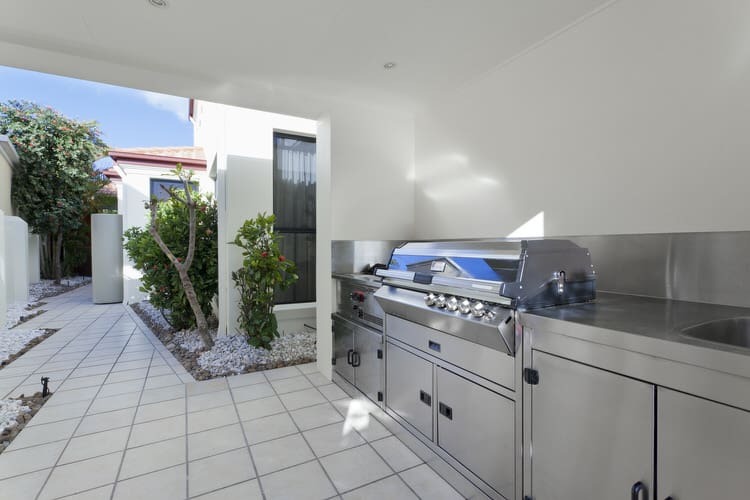 It is also less expensive to run gas, water and electricity lines a short distance to your outdoor kitchen. This charming New England courtyard setting is the perfect location for outdoor entertaining. The grill and food prep area will accommodate preparation of an intimate dinner or burgers for a neighborhood block party. The grill sits beneath a pergola to keep the chef cool on those steamy northeastern summer days. One of the most useful appliances in outdoor kitchens is the side burner. Even portable grills feature single or double side burners to make cooking an entire meal outside that much easier. Instead of relying your indoor cooktop, you can heat sauces, steam vegetables or boil potatoes right next to your grilling surface. 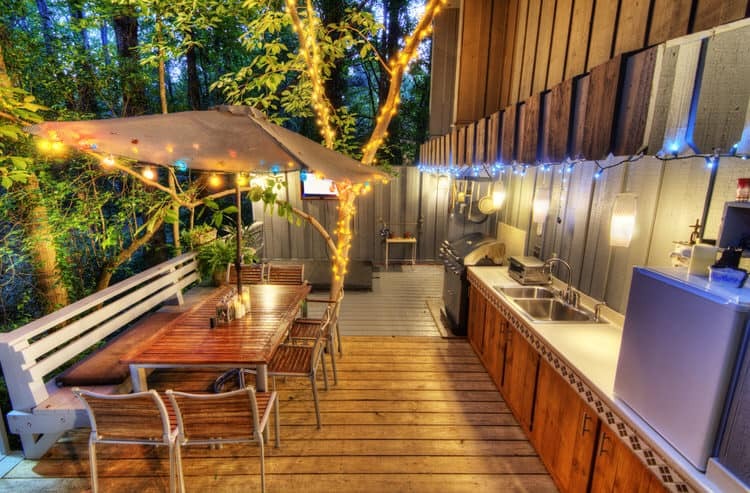 When you’re designing your outdoor kitchen don’t fall into this trap. The two most common mistakes homeowners make is not allowing for enough counter space and storage. 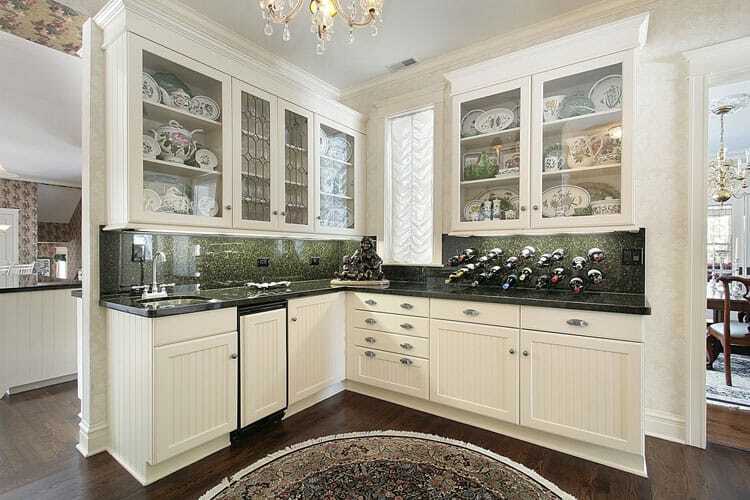 This Santa Fe kitchen includes plenty of counter space for multiple people to prep and serve. The under counter cabinets house refrigeration drawers as well as ample storage for dinnerware, utensils, pots, pans, linens and serving pieces. 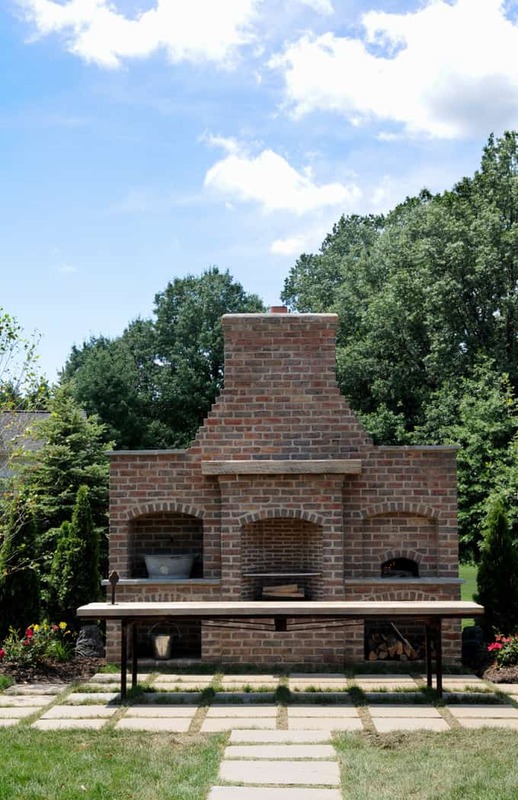 Creating an outdoor kitchen using conventional construction methods can take weeks. Then there’s the matter of cost of materials and labor. Using a prefab modular kit will take no more than a weekend day to assemble. You can reduce your budget up to 40 percent and start cooking the very next day! 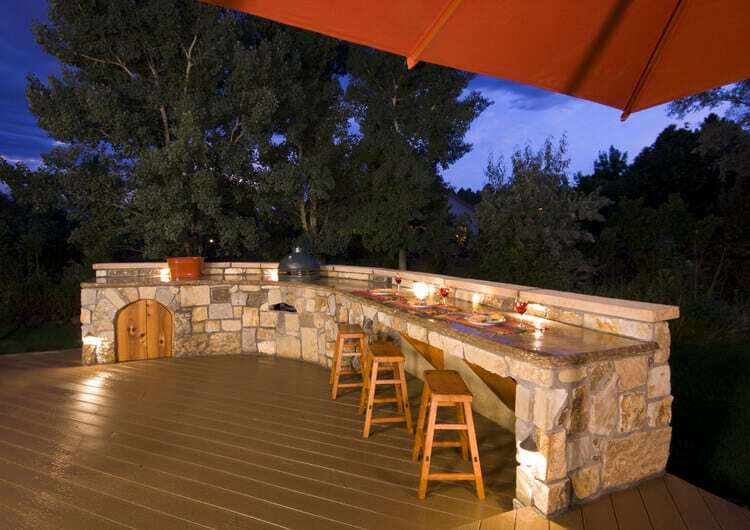 The sky’s the limit as to what you can include in your outdoor kitchen. But a quality grill is really all you’ll need to create a dinner your guests will talking about all summer long. This stainless grill station is one of the best on the market and boasts scads of extras that will make outdoor cooking effortless! 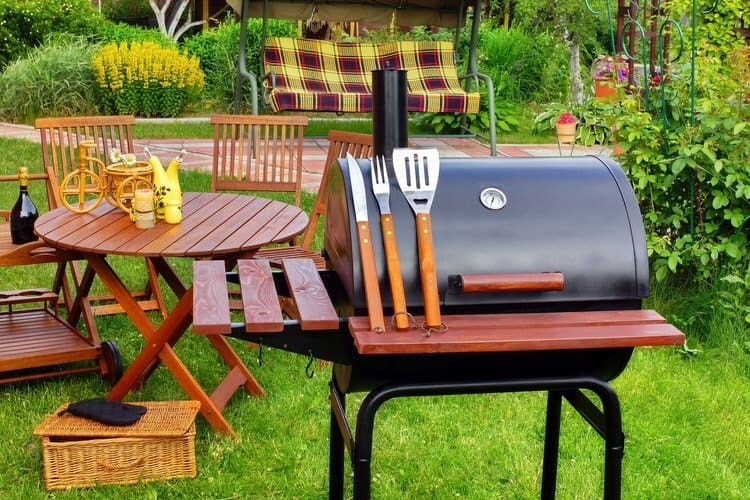 If you’re short on cooking and entertaining space and still enjoy grilling, keep your outdoor kitchen components super simple. This portable charcoal barrel grill has convenient side and front folding shelves giving you a place for platters and utensils. 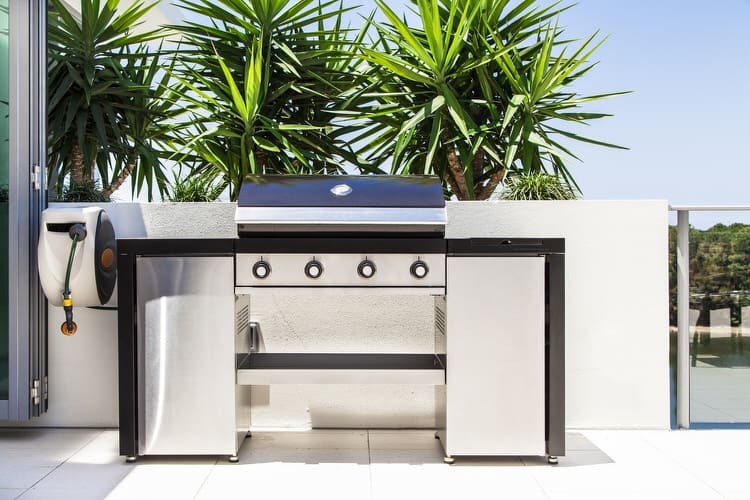 Features like an adjustable steel grate, heat control dampers and a temperature gauge will get you barbequing, grilling and searing just like the pros.